Published by breathmint on March 6, 2010 in mp3 and review. 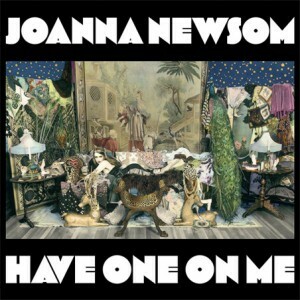 0 Comments Tags: Have One On Me, Joanna Newsom. After a break of over three years, we recently saw the release of Joanna Newsom’s latest record, Have One On Me. This is a triple CD, each consisting of six songs for a total of 18 tracks spanning over 2 hours. If you saw my The Best Albums of 2000~2009 post, then you know that The Milk-Eyed Mender is amongst my favorite records of the last decade (I also loved Ys). I was so excited after hearing this I felt the need to write and tell you all how wonderful it is! While maintaining her signature style, Joanna takes on a more soulful tone here. I read an interview with Joanna where she was asked about her influences. She went on to describe some hippy harp circles where she learned about west African rhythms, etc. as well as various types of world/folk music. The few pop references she provided included Donovan, Dylan, and Billie Holiday – but I tend to hear a bit of Joni Mitchell (one of my all time favorites) and perhaps even Janis Joplin in this record. I can’t wait to listen to this more and form a more concrete opinion, but I think I can already conclude this will be amongst my favorites this year. Buy it here. Published by breathmint on March 6, 2010 in mp3 and summary. 0 Comments Tags: Beach House, Eels, Efterklang, Four Tet, Get Well Soon, Good Shoes, Nu Gaze, The Knife, Yeti Lane. If 2009 started off hard and heavy with a series of awesome records (for the record: yes it did), “2010 so far” is a bit underwhelming for me personally. That isn’t to say there aren’t a few solid records now which have made my regular rotation. The Knife – Tomorrow, In A Year. Leave it to The Knife to not disappoint! I didn’t know what to expect when I heard (over a year ago) that their next project was to accompany an opera about Charles Darwin (that was being produced by a Danish experimental theatre group), but I expected to be pleased. Having under a dozen listens under my belt it’s difficult to try and write anything resembling a proper review of this, because it’s actually quite layered and complex. I may or may not attempt something like that later, but for now I can say for sure – I love this and highly recommend you check it out! It is definitely the most unique record I have heard in I can’t say how long! Buy it here. Eels – Endtimes is the last record (so far) I have found this year which immediately drew me in. It documents Mark Everett’s (he IS Eels) 2005 divorce with his wife and the feelings which ensued. It’s some heavy stuff, definitely not something you should expect to throw on at work to quickly pass the time while coding. This is definitely a highly recommended record, though. Check it out now [full album stream on myspace], or buy it here. Beach House – Teen Dream. I don’t have a ton to say about this record, except that I am appreciating it more than their previous work, and it seems to be continually growing on me with each lesson. More later? Buy it here. Four Tet – There Is Love In You is filled with dreamy reverberated percussive samplings, warm and hypnotic synth hooks, and a nice selection of processed vocals which serve both to tie together the nine tracks and add a layer of emotions to what might otherwise be complete abstraction. This isn’t strictly dance music but there are definitely elements of that, with some intermingled segments of house tempo 4/4 showing up on tracks like ‘This Unfolds’ while others such as ‘Plastic People’ pretty much operating exclusively in that vein. Recommended – buy it here. Yeti Lane‘s self titled debut is an example of why I am paying (slightly) closer attention lately to European bands (they’re French!) lately. It’s Beatles-esque psychedelia with a good dose of what apparently is my favorite (its taken me years to realize this) genre: newgaze (or nu gaze). That’s “new” (post-2000?) shoegaze. I recently thought of this term and after googling it was disheartened to find someone had already thought of it and in fact started a last.fm group dedicated to the idea (and here I thought I was so clever). In any case, check them out if you like that sort of thing buy it here). And by the way, don’t mistake my having placed “nu gaze” just after mentioning these guys are European as some sort of intended statement. Mosts of the groups emerging in this genre are coming out of the US. Get Well Soon – Vexations. These guys seriously wowed me with their first record Rest Now, Weary Head! You Will Get Well Soon so I had very high expectations/hopes for this one. Although it hasn’t quite lived up to them, this is a solid record and I recommend it to fans of their earlier stuff. Efterklang – Magic Chairs. I have heard good things about these guys before, but this was my introduction to their music, and I dig. Looking forward to checking out (what has been described as quite varied) back catalog soon. Good Shoes – No Hope, No Future. Maybe the only upbeat(ish) record so far of 2010 I have found/dug. Did I miss out on some mutual agreement that everyone else was going to release slow and quiet records from now on? I hope not, and after hearing Good Shoes I’m optimistic someone will be rocking out real soon (Snowden, I’m looking your way). Then there’s the stuff I’m not really digging. Everyone is going on about Yeasayer. I am a naysayer. I dislike the dude’s voice, and for me that’s easily enough to kill it. Hot Chip’s latest One Life Stand is just as disappointing as Made In The Dark (which I insist should have stayed in the dark – OH SNAP). These guys are a bit of a mystery to me having shown such weak efforts after 2006’s The Warning which is, to put it quite simply, amazing. I hope they get it together soon. Vampire Weekend – Contra. Meh. A multitude of other recommendations have come my way and been dismissed as mediocre at best. If anyone has a tip, I’d love to hear from you. Published by breathmint on March 6, 2010 in mp3. 0 Comments Tags: Beck. Over the last few years I have accumulated growing numbers of friends, family, colleagues, etc. asking me for music recommendations, turning to me for news/updates on artists, etc. Nearly independently I feel the need to talk about the music and bands I am listening to, loving, and perhaps not digging so much. I have done this in a few different places. Primarily it’s carried on through personal conversations, instant messaging, text messaging, email, etc. I have also used a few different blogs to write about music. I started with myspace which I quickly found to be lacking and inefficient. Then there was mog, which I actually liked quite a bit. However, they have undergone several site updates which have rendered it into something like “everything else.” I like the idea of having complete control over my content and format, and after finding wordpress a while back I set up “Good News” as part of my Snowden fan site snowdenology. It was mainly intended to serve as a “snowden blog” but I found myself starting to include entries for recent mixes, “best of lists”, etc. Right about this time I was talking to a friend over at Tasty Fever! who suggested having a separate blog just for music writing. She’s going to be our London correspondent here too – more on that later. So that’s how I got here at cyanidebreathmint.net‘s first post. Would you believe the first post on my new music blog doesn’t even have any music mentioned it? Don’t fret! That’s why today I have for you, 2010 So Far AND [bonus beats] Have One On Me. In closing, I share with you lyrics from this blog’s name sake. We’re going to try anyway. Speaking of which, I changed my mind (about the no music in this post thing). The song is from the amazing album One Foot In The Grave, which you can and very much should buy here.